Symptoms of the common cold, such as congestion, increased mucous, fever and sore throat, may be reduced by cayenne pepper. The pepper, commonly known for its hot and zesty flavor was used by Native Americans for thousands of years, not only as a component in cooking, but for its health properties. Only a pinch of the spice is necessary, due to the fiery hotness of the pepper. If you do not find relief from your cold symptoms after several weeks, consult with a medical professional. Cayenne and other hot peppers contain high amounts of capsaicin. Besides the pungent heat effect of the compound, it also aids in congestion relief. 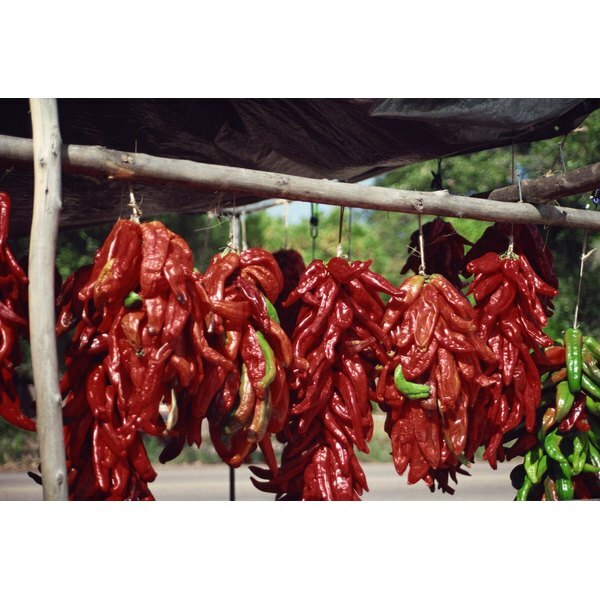 Consuming cayenne peppers, raw or in dry powder form, loosens nasal and sinus congestion. Mucous thins and becomes more liquid, making breathing easier. According to "The Encyclopedia of Healing Foods" by naturopathic doctor Michael Murray, the ingredient also stimulates blood flow to mucous tissues, relieving congested sinus or a stuffy nose. A key vitamin in cayenne pepper is vitamin A. According to "The World's Healthiest Foods" by nutritionist George Mateljan, 2 tsp. of cayenne pepper contains about 30 percent of your daily value of vitamin A. Though this amount will be less per serving size when used in dishes, it is significant. Vitamin A protects the body when an infection is present, especially a cold. According to "Staying Healthy with Nutrition," by Dr. Elson Haas, vitamin A supports the health of tissue and mucous barriers. According to Haas, absorption of the vitamin is reduced with alcohol consumption or when a vitamin E deficiency is present. When you are suffering from a cold, you may also be suffering from a fever. Cayenne pepper naturally reduces your core body temperature and naturally cools the body. Many cultures in hot climates have embraced the pepper for this very reason. When suffering from a fever, add cayenne pepper to foods, hot lemon water and tea to possibly decrease your fever. Most cold sufferers experience a low-grade fever, according to MayoClinic.com. This fever usually reaches no more than 102 degrees Fahrenheit. However, if it continues for more than two to three days, visit your doctor. Cold viruses are always present, and most Americans suffer from a cold at least once or twice a year, if not more. Though cold is common, it is critical to monitor your condition. Complications may include ear infections, respiratory distress and sinusitis. According to MayoClinic.com, secondary conditions may include croup in small children, as well as pneumonia and bronchitis in both children and adults. Medical attention is required if a secondary infection is present.